National Day may hold different meanings to every Singaporean. To some it is a day of celebration, to wish the nation a Happy Birthday. To others it is a day of pride, appreciating the fact that our little nation had grown in strength from its origins as a fishing village to a modern city state. There are those who reckon that it is just another holiday. For us, it is a day we celebrate our roots as Singaporeans. On this day , we proudly adorn our Red and White outfits to honour the nation. Over the past 7 years, the family had tried to get NDP tickets without much success. Instead we have to be contended with a view from the TV to mark National Day. This year, we were privilege to be given the chance to celebrate at the NDP @ Marina Bay. This will be the last year the parade will be held at the Marina Bay Floating platform. For next year for Singapore 50th birthday, it will be held at the Padang. Thereafter the new National Stadium will be home to NDP from henceforth. This parade not only marks the 49th birthday of the nation, but a fond farewell to Marina Bay Floating platform as a National Day venue. This was an occasion not to be missed. Braving the scorching sun, we are already in position starting from 3 pm. Our friend , The Little Brick Man was there too! It was a heart-warming sight to see a sea of Red and white at the float. There, like minded citizens sang out past NDP songs, cheered and celebrated as one people. The boys too soak in the atmosphere with every cheer and flag waving. We are here to celebrate regardless of race, language or religion. No matter what our differences are, we are here for one single purpose. That is to celebration Singapore birthday as one people, one nation, one Singapore. It was heartwarming to be in the midst of like minded citizens. Putting difference aside and celebrating as one. The atmosphere picked up a notch when the familiar Red Lions descend from the clouds. For those who have not seen them in action, we say this is definitely an intriguing act of precision. Soon the parade commence with the march past and the guard of honour. 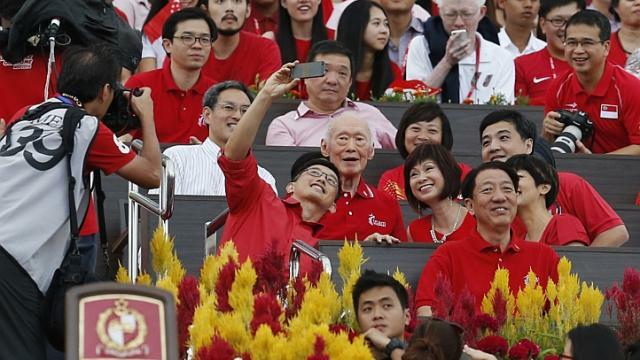 Then the place erupted when Lee Kuan Yew, our founding father of modern Singapore arrived. Regardless where your political alliance lies, one thing is for sure. Without Mr Lee, we would not have be where we are today. Respect is to be earned and not imposed. For us, he has our utmost respect in his role as the nation builder. It was no surprise that the audience appreciate his presence at the floating platform with the loudest of cheer when he arrived. 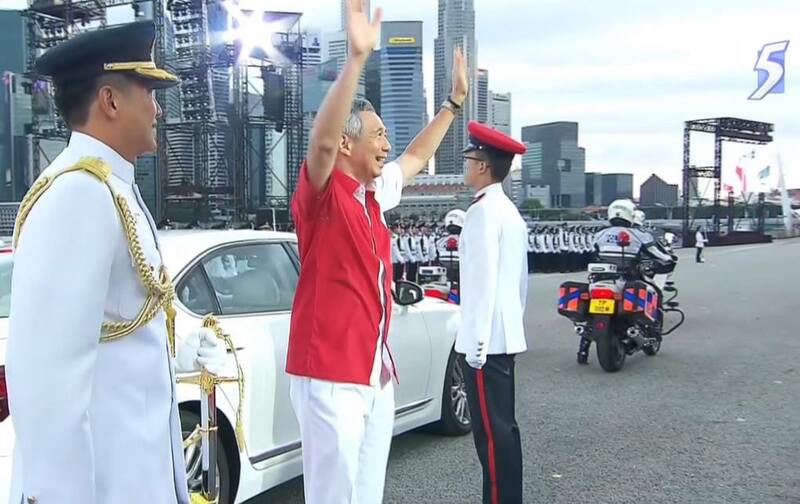 Soon PM Lee and President Dr Tan arrived. For the boys, it was an opportunity to introduce them to the leaders of Singapore. The pledge was said when the chinooks flew past with the big Singapore flag. This was followed swiftly by the Black Knights. Unfortunately they did not did their practised split to the poor weather condition. The parade continues with the 21 Gun Salute and inspection of the Guards of Honour. Thankfully the weather cooperated and held off its threatening rain. This year march past was made more special with a contingent from MINDS taking centerstage. Singapore impressive arsenal of tanks were on display as well. The parade continues with a musical celebrations of colours. It culmulate to a mass recital of The Pledge. And the moment many are waiting for , Fireworks that lit up the sky and closes the ceremony. From start to end, we spend almost 6 hours at the Float. It was amazing the boys managed to keep their composure during this period. We have been to numerous invitation and events till date. If you ask me, this was the most meaningful one we had the privilege to participate. It was a day to remember for the family. Finally we can proudly say we had been to an National Day Parade. Looking forward to more parades in the future.